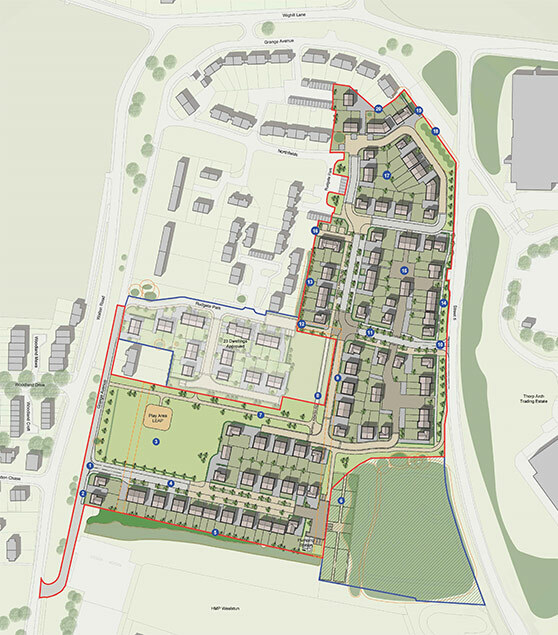 In July 2017, Tibbalds CampbellReith was appointed by the HCA to prepare and submit an outline planning application for the Phase 2 Site at HMP Wealstun. This followed a previous HCA instruction for the development of 23 residential dwellings on the adjacent site of a former Prison Officer’s Club (Phase 1). The Phase 2 site was also proposed for residential use. Following the approach established on the Phase 1 work, and the stakeholder relationships that had been developed by our team, we undertook extensive consultation with the parish councils (Walton Parish Council and Thorp Arch Parish Council) and consulted with Leeds City Council, to ensure a proposed masterplan was developed that met the needs and aspirations of the local community. Our team provided all necessary technical inputs to support the planning application, including town planning, masterplanning, environmental, biodiversity, viability advice, transport and highway issues, land quality and drainage assessments. Progression of the scheme at pace was a key Client objective and we proactively undertook several detailed surveys to ensure technical constraints could be overcome, including detailed drainage surveys and liaison with Yorkshire Water to prove foul and surface water drainage capacity existed. We liaised with the case officer, parish councils and public objectors to identify actions taken in respect of their concerns on the existing network and the presentation at planning committee detailed this process and the effort put in by the team to alleviate local issues.